For the rest of the pregnancy, I ate red meat two or three times a week, as well as my usual high intake of leafy greens and vitamin C-rich foods, and my iron levels returned to normal – I didn’t even have to take any supplements in the final trimester. And I felt fabulous. I slowly took up sustainable fish and lamb, but it took another couple years before I could eat poultry or pork, and only when I could find free range. I really never even considered returning to a vegetarian diet – I had started to better understand the role that livestock plays in sustainable farming, and I became increasingly aware of where to source meat that had been sustainably and ethically raised. Of course, these days in Australia the options are improving all the time, especially for those with ready access to farmers’ markets and armed with the knowledge to frequent them and seek out ethical producers. On the sustainability question I can cite a lot of research that supports systems that integrate livestock into holistic agricultural systems. My post on agroecology and food security has links to some of that research, as do my notes from the 2011 Sustainable Food Summit, and I’d strongly recommend reading ‘Meat: a Benign Extravagance‘ by Simon Fairlie, which even converted the previously staunch vegan George Monbiot to advocating for sustainable agricultural systems that include livestock. Monbiot’s post is an excellent overview of Fairlie’s book, and captures the key messages about inaccurate reporting of feed conversion ratios, livestock water consumption, and other fallacies that lead to the conclusion that one shouldn’t eat meat. So while it’s easy these days to counter the ‘animal farming is unsustainable’ furphy with an increasing body of evidence that show how we can feed the world with small-scale, integrated, ethical agricultural systems (because of course the vegans and ethical omnivores already agree that intensively farming animals is both unsustainable and unethical), the ethical disagreement seems harder. My recent twitter debate with vegan activist @MSizer reminded me what an impasse we come to when his position is ‘it’s immoral to eat animals’ and mine is ‘no it’s not’. Although I have some background in philosophy, it’s not my discipline, but there was an excellent article in the Conversation that went through the very difficult and complex philosophical arguments around eating animals that I recommend you read. The fundamental question is whether one believes it is okay to take an animal’s life for our nutrition and pleasure. @MSizer does not believe it is morally defensible to do so, but like many other omnivores, I believe it is, so long as the animal has lived a pain and stress-free life on the paddock in an environment that allowed it to engage in its instinctive behaviours, and that its slaughter is quick and painless, and preferably done without the animal knowing it was about to happen. I am comfortable with humans eating non-human animals in the same way that I am comfortable with birds eating worms or lions eating antelope. I have a pang of sadness for the life lost, especially at such times as we face that death in person, such as when we slaughter our own chickens, just as I have a pang when I see footage of a predator taking its prey in the wild. That doesn’t mean I don’t think it should happen. The more deeply engaged I have become with these ethical concerns, the more mindful my meat eating is – I am horrified these days if I overcook a piece of meat, and have recently caught myself saying, ‘this animal gave us its life, we should cook it with the respect it is due’. I am also a strong advocate for and practitioner of a reduction of meat and dairy consumption in the average Australian’s diet (and other members of high-meat-eating societies, of course). If we all simply ate less then the demand pressures that got us into this unsustainable, unethical industrial food mess would diminish, and our global food security issues would with them. But that is my position, and I should address the position put forward by the likes of Animals Australia, PETA and @MSizer, that is, that it is immoral to kill and eat animals. I don’t really think I could convince vegans with this ethical code that it’s not immoral, and frankly, I’m not really interested in trying. I have great respect for people who have chosen a vegan diet out of compassion, and I’m definitely not interested in trying to get this very small minority to take up meat eating again. But I would like to put two important questions to them. First, if you believe it is immoral to eat animals, does that mean that people in the global south on subsistent diets who are able to access some meat in a very nutritionally limited diet are immoral for doing so? Would you begrudge the one in six people in the world who are food insecure or starving the right to eat meat if they can? And if not, is your ethical position perhaps not so absolute as you suggest it to be? Second, I think it’s wonderful that groups such as Animals Australia fight for animal rights, but to draw attention to the worst abuses of industrial farming and then draw the conclusion that therefore we shouldn’t eat meat is totally unproductive in the campaign to improve animal welfare in agriculture. I know their premise remains ‘but you shouldn’t eat meat’, but the very simple reality is that the majority of those who can eat meat in the world will continue to for a very long time to come, perhaps forever, and no amount of activism will stop that. There are deeply rooted cultural, social and economic reasons why it is so, as well as the environmental ones whereby livestock are healthy contributors in agroecological systems such as these examples in China. The most positive impact any of us can have on the majority omnivorous culture is to fight for stronger animal welfare measures in agriculture right now. A personal decision not to eat animal products is a powerful statement in itself, and will cause a level of reflection amongst those with whom you engage, but if you don’t join the vocal fight for ethical animal agriculture, in my opinion, you’re wasting a valuable opportunity to work with ethical omnivores to change policy, regulation and awareness of improved production models amongst producers. By starting the conversation with, ‘I think you’re immoral’, you alienate most omnivores immediately, and are then far less likely to actually influence their decisions. I’m a free-range pig farmer. I despise intensive farms with pigs in huge sheds on concrete, the use of sow stalls, routine castration, docking and the entirety of how those poor animals are treated over the course of their short lives. The ‘outdoor bred’ farms are an improvement, and one that I am happy to acknowledge and indeed even promote as a better option than the former. I still want pigs raised outside on pasture their whole lives, but I’m glad the outdoor bred growers have sprung up to provide more humane treatment for the millions of pork eaters out there. I’d like eventually for all pigs to be free range, just as I want all animals to be. We may not get there, but I’ll keep fighting. Vegans such as @MSizer want no animals grown for our consumption and I don’t begrudge you that position, but in the meanwhile, you could still acknowledge the vastly better conditions under true free-range production models and push for all animal agriculture to be to those standards. So long as animals are raised for food, I reckon its unconscionable not to. – northern Australia has vast cattle stations running huge numbers of cattle on native pasture, existing in harmony with native animals. It’s not just ‘small’ farming systems that operate in a humane & environmentally responsible & sustainable manner. – eating less meat doesn’t help the environment. Eating food produced in a sustainable manner does help the environment. Vital to make this distinction. Read labels! Choose grassfed over grainfed, etc. – The NHMRC recommends Australian girls & women include more meat in their diet as so many are iron (& other vital nutrient) deficient. I think the comments posted by “J” are very insightful and worthy of a second read. Tammi seemed to mostly brush them off without properly examining them. I also think that Tammi is creating a false dichotomy between welfarism and abolitionism. Can’t there be a focus on both? If I were being wrongfully imprisoned, I would need two things from my family: 1. campaign for my release, and 2. campaign to improve my living conditions. Neither approach is adequate on its own, and we owe it to the animals to use both approaches. If we only campaign for improved conditions and improved slaughter practices, we effectively guarantee that more animals will continue to suffer because the exploitation continues, and we actually contribute to people feeling good about their exploitation. But on the other side of the coin, if we only campaign for abolition as a goal, which would take years to achieve, that is of no help to the animals currently being enslaved and exploited in the meantime. 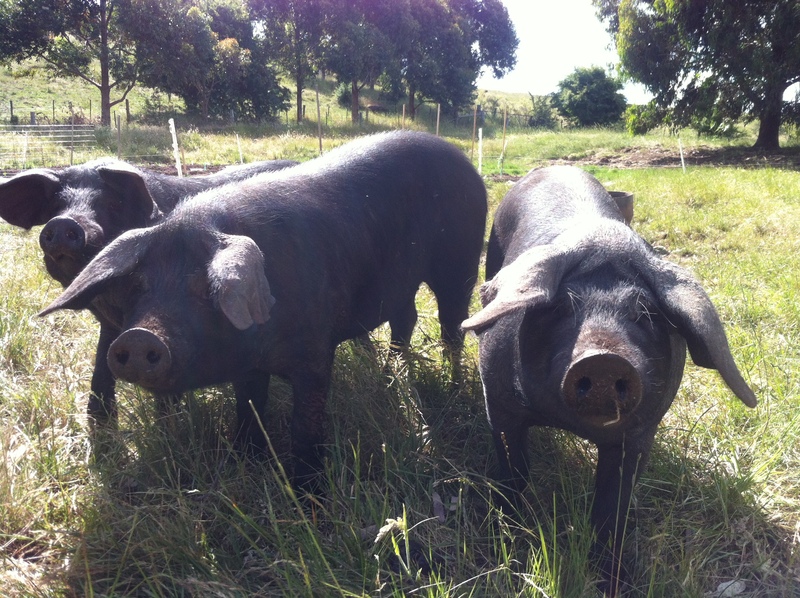 I fully support organisations like Melbourne Pig Save (https://www.facebook.com/MelbournePigSave), who are highly effective in their two-pronged approach. They campaign against factory farming, sow stalls, farrowing crates and mutilations done without anaesthesia (castration, tail-docking, teeth-clipping, ear-notching), but promote veganism as an ethical baseline. The key point is that animal farmers will always be motivated to take shortcuts where it would be financially beneficial. There will always be pressure to increase stocking densities as surely as the human population is increasing. This is an intrinsic characteristic of animal farming, and it is why supporting it on any level will contribute to suffering. We can’t monitor every farm and abattoir with 24 hour CCTV coverage, and by simply purchasing meat, free-range or otherwise, people contribute to shortcuts being taken to increase production efficiency at the expense of animal welfare. I’ve now read through the follow-on comments and you do come across as somewhat arrogant. As I mentioned above, rather than criticising those who remain committed to not valuing their tastebuds over an animal’s life – you should look more closely within yourself and make some honest assessments. Until you are honest with yourself these defences will continue and you will alienate others. Just admit you were too lazy/tired/inconvenienced/missed the taste of meat to continue a vegetarian lifestyle. People will respect you more for the truth and you will be able to move away from defensive justifications and attacks on others. to do the jobs needed for good bone health. Thank Christ I found your post. Yes, it is about the animal having a happy and healthy life and not knowing when it’s going to disappear. That’s the way it is in the wild with the whole predator / prey scenario. Another point to note is that most (well every single one I have met anyway) vegetarian and vegans have little to no knowledge of the basics of nutrition. I have had had several vegetarian friends and a few vegetarian girlfriends and as accepting as I tried to be, they all had thinking, physical energy and emotional issues that they could not seem to work themselves out of. They were lacking in one or several of the basic elements that made up a healthy diet. The retaliation to this comment is that it is a discrimination thing against vegetarians. Not true. You should be able to get almost everything you need without eating meat. I’ve tried, but it is super difficult and takes lots of planning and organisation skills. Not to mention the volume of food you need to eat. To do it long term I think I would need even more knowledge than I posses to get all the correct trace elements and correct types of fats and oils in the body from just plants. Even then it is easy to miss something. Agreeing with the article above, the vegetarian and vegan community does alienate the very crowd they are trying to protest against. Furthermore they are mostly unhappy as they haven’t eaten enough of the right spectrum of foods. If a person is generally in an unhappy state they are polluting society with unhappiness and people do not want to be around them. This state of mind makes it very difficult to raise awareness to an issue like poor treatment of animals and the overeating of meat products. Thanks Tammi for your great article and lets hope more ethical omnivores like yourself appear. Umm, just two quick questions for the vegan people…If we don’t slaughter any more animals, starting from tomorrow, what do we do with them all? If we take a look at cultures where animals of all kinds (even vermin) are cared for, we will end up living in poverty like the people of India. Second question, if harming all animals is bad, can the Asian populations still eat insects, or is this unethical too? Bugs have feelings too. Bear in mind that insects and spiders are often the only source of protein for people in some of the world’s poorest countries. It would be pretty self indulgent to suggest that they are unethical. I am a proud farmer. Our family raise beef in the most humane way possible and take the very best care of our animals. I am also happy to throw out buckets of rat baits every year, and I shoot feral cats and rabbits. Imagine the crops we would produce if rabbits and rats weren’t controlled! (or don’t those animals count?) Imagine the decimation of native species if cats are left unchecked (maybe we should catch and desex them all??) I’m sorry, vegan people, it is simply unrealistic and unsustainable to live in your fairy land. All the livestock, rabbits and rats will be eating your soybeans…!